Our commitment to Quality. . . . . . . .. .
“To deliver products, quality, and services... On time, every time.”. . .. . . . . . . . . . . . . . . . . . . . . . . . . . . . . . .. . . . . . If you wish to see a preview of your private label, you can take a look at our new app for Label Design. At ALANI we seek to be the strategic partner of every customer, giving the best possible value to each of them. Setting standards of excellence in quality, performance and service, has always been and will ever be a priority. We produce a complete professional range of pure cellulose tissue paper products coming from reforested forests. Our distribution facilities allow the storage of over 700 pallets. Alani SL currently distributes to 27 countries. Concentrated compact products, with an innovative design to reduce environmental impact, produce savings and improve efficiency in cleaning. All our products have been exclusively selected for their quality assurance and for their small size. – Flexibility: “Big enough to fulfill your needs but small enough to care”. – Private Label in both Paper Products and Dispensers. – Compact, concentrated and ecological tissue paper products. – Urgent Deliveries in 24 hours. We provide Hygiene solutions for specific needs. But we make it faster and easier for the customer at a lower cost. Alani S.L. is focused in the production of products which reduce unnecessary waste, space ,labour time, administrative and logistic costs. (offering important savings in labour, transport, stock and maintenance costs). We are a company focused in progress, therefore we are constantly innovating. Bringing new products to the market that will guarantee customer satisfaction and Ecological improvement. En ALANI hacemos las cosas eficientemente. Proveemos soluciones profesionales de higiene para necesidades especìficas. Pero lo hacemos mas ràpido y màs sencillo para nuestros clientes al mejor precio. At ALANI our main priority is quality, for both our products and our service. Only then can we guarantee our clients the consistency and reliability they are looking for their business. 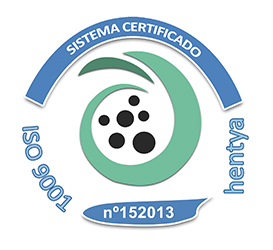 Therefore, we recently acquired the ISO 9001 certificate. ISO 9001 is the common quality standard recognized by all sectors internationally. It is based on continuous improvement of processes and can demonstrate an organization’s commitment to the quality of their product or service and customer satisfaction. With the management system certification ISO 9001, the organization obtains a public acknowledgment by an evaluation process conducted by an independent third party.